Title: "The Story of Ruby Bridges"
It's 1960, our nation is in a time of great social change and political upheaval. After a landmark decision by the courts of New Orleans, to much protest by the exclusively white school district, six year old Ruby Bridges, is allowed to attend William Frantz Elementary School, an "all white school", becoming the the first African American child to do so there. The young girl must now enter an environment violently unwelcoming of her, and one that is deeply intrenched with the ideologies that aim to maintain segregation. Despite prejudice, young Ruby faces, along with great resistance, she never backs down from going to school. The story of Ruby Bridges is one of trial and tribulation, protests and a mass exodus from the school by white students, at the hands of their parents. While Ruby attends her first year as the only student in the school, learning to write and read in empty classrooms, after two boys return to school, the rest soon follow. With their return, the beginning of the end for separate schooling at William Frantz Elementary, but not inequality in education. Element Three: "Issues of Social Injustice"
This is not only an actual account of what many children faced during the desegregation of schools in our nation, it's a story about a shared experience, of preserving, hope and overcoming oppression. This story serves as a great cornerstone to any lesson about racism, embracing diversity and the covering of issues of Social Injustice as it gives the students a story with a character they can connect with, especially those of African American heritage. Looking specifically at Element Three, the critical need for teachers to actively scaffold children in their development of "connections between the historical roots of oppression" so that they gain understanding of "lived experiences and material conditions of not only people through out history". As children learn the history of oppression associated with the specific injustice, they are then able to make connections to "the current state of being and living for people of all oppressed groups today". Here, these goals can rightfully be covered by means of comparing the environment Ruby learned in with that of those children in minorities are in today. Through use of this book, children are exposed to the concept that while legislation can invoke equality, social change and beliefs are much more difficult to change. This can open the class up to a multitude of different discussions and activities depending on the discretion of the teacher. Social injustice has many faces and this book serves well as a means to expose students ages 5-8 years old, to the experience of a child in their age group to which they can directly relate to, thus making the story even more meaningful and relatable. To include this book into a lesson would not serve the students whole-fully. To not only cover the experience of ruby but the history of oppression, the teacher should make it a point to make the lesson inclusive of group work and class discussion. The following is a short lesson plan/activity to engage the students in post reading the book. 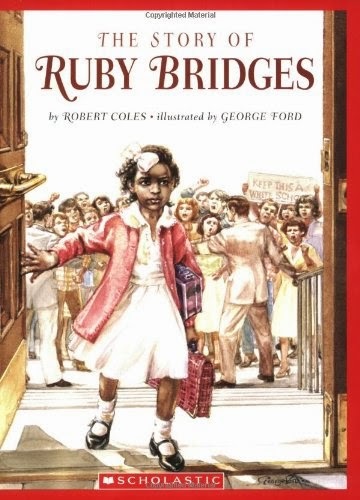 Read Aloud "The Story of Ruby Bridges"
During the reading, pause at teachable moments, prompting the children to connect and reflect on not only what is happening and why it is wrong, but how they believe ruby feels. The class will regroup and engage in discussion facilitated by the teacher where they will share what they wrote down. After this activity, the teacher will present either on the board, projector or smart board, a two column part. In the first column's header there should be "1960" and in the second "Today". The teacher will call on the class to give examples from the book of what it was like in school for ruby during the 1960s and for them today. Students will compare both columns with help from the teacher and discuss how things have changed. It is important for the teacher to inform the students that these changes are still happening and how they can be part of the change.